As a technology with the power to “reduce costs, increase reimbursement, and improve the quality of care,” contact-free continuous monitoring (CFCM) can give alternate care facilities like post-acute care centers (PACs) and skilled nursing facilities (SNFs) new opportunities to raise their standard of care while improving financial performance. 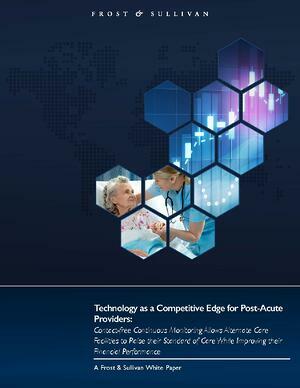 So argue the authors of a new white paper from Frost & Sullivan entitled “Technology as a Competitive Edge for Post-Acute Providers,” which posits that the average alternate care facility can increase revenue by as much as 22% and raise profits by as much as 13% with the use of CFCM in just a portion of existing beds. Those numbers are particularly noteworthy given the competitive nature of the alternate care market, where profit margins are razor-thin and “the importance of making the right strategic investments that deliver the greatest ROI has never been higher,” as the authors note. “Considering the different investments required to succeed, post-acute facilities should be alert to disruptive technologies that will help them … advance their position as a leading provider,” they add. The growing tendency to treat lower acuity patients at home via telehealth is contributing to increased referrals for higher acuity patients into alternate facilities. And with referral sources becoming scarcer, maintaining existing relationships — and accepting higher acuity referrals — is becoming essential. Because it more closely monitors their status, the installation of contact-free continuous monitoring technology gives facilities the means to treat more medically complex patients without taking on undue risk. The competitive advantages of technology. A willingness and capability to admit higher-acuity patients not only gives facilities more revenue streams, it also provides a key competitive advantage at a time when most facilities “operate on very thin margins,” the authors note. Facilities taking on this technology will find themselves among an elite group; so far, fewer than 1% of PAC facilities in the U.S. have adopted contact-free continuous monitoring. The need for improved care quality and capacity. Whether or not a facility is prepared to accept more higher acuity patients, today’s competitive market demands that facilities increase “the level and quality of care,” while preparing for a payment model that’s built around episode of care instead of fee for service. CFCM technology can give PAC facilities the power to adapt to stricter CMS clinical standards relating to “traditional bed exit and body” and can help SNFs raise quality standards to secure higher reimbursements under the Skilled Nursing Facility Value Based Purchasing (SNFVBP) program. CFCM has been shown to decrease readmissions, “a key priority for hospital partners,” many of which now make referral decisions based on readmission rates.